The concept of morphing and maps was influenced with the subjects of lectures from the first week. Development went towards the image of common dance from the movie “Salto” by Tadeusz Konwicki (Witold Mrożek lecture) and the issue of sexual politics, as the most confronting for the participants of the project as well as probably for the coming audience. “Salto” presents a common dance in ballroom hall, which seems to be a previous synagogue and belongs to all the people leaving in a small village. The characters join the dance with or without their own choice. Mostly influenced by a stranger, a conductor, who is coming to their life one day from nowhere. The dance reminds a zombi ritual with square, regular movement. 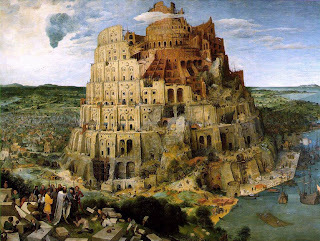 The story of the Babel tower from the Bible (Genesis 11) represents an opposite process of solidarity and disorder. Referring to our time, when use of the languages, as well as other communicative paths bring people together towards one language we are looking for communication within different nations, mother languages or cultural background. Nine sentences of the biblical text where divided between national groups of maProject dancers in their mother language. Two Dutch got phrases 7 and 8, five Lithuanians – 3 and 6, four Polish – 4 and 9, German – 2 and Portuguese – 5. Each of them translated the meaning in gestures and built a sentence of movements. Later they taught their phrases to each other, adding them one to another and creating a tower of movement “language”. Bible Genesis 11 The Tower of Babel 1 Now the whole world had one language and a common speech. 2 As men moved eastward, they found a plain in Shinar and settled there. 3 They said to each other, "Come, let's make bricks and bake them thoroughly." They used brick instead of stone, and tar for mortar. 4 Then they said, "Come, let us build ourselves a city, with a tower that reaches to the heavens, so that we may make a name for ourselves and not be scattered over the face of the whole earth." 5 But the LORD came down to see the city and the tower that the men were building. 6 The LORD said, "If as one people speaking the same language they have begun to do this, then nothing they plan to do will be impossible for them. 7 Come, let us go down and confuse their language so they will not understand each other." 8 So the LORD scattered them from there over all the earth, and they stopped building the city. 9 That is why it was called Babel — because there the LORD confused the language of the whole world. From there the LORD scattered them over the face of the whole earth. Further on we took a look on traditional background from individual perspective. Everyone brought with him something which resembles his identity. Who remembers the oranges which were a symbol of health in communistic time in East European countries? Referring to that time orange was a random food, symbolic exchange of goods coming from the West to the East. Morphing portraits refers to the process of constant changes within genres, traditions, cultures, nature, etc. Morphing put in opposition to a-morphing gets a relation to maps with foggy image, DNA or cells. For practical level – metaphorical and conceptual – what is the map of life? We approach the body to map the emotions. Reading the inside to poor it out, express. Processing the emotions form neutral to spastic. Mapping the body got an assistant – a ball, which is travelling from the center/core through the whole body. The task was to establish the rout for example from the shoulder to the toe. On Tuesday and Thursday afternoon we shared one studio and exchange the results of the work.